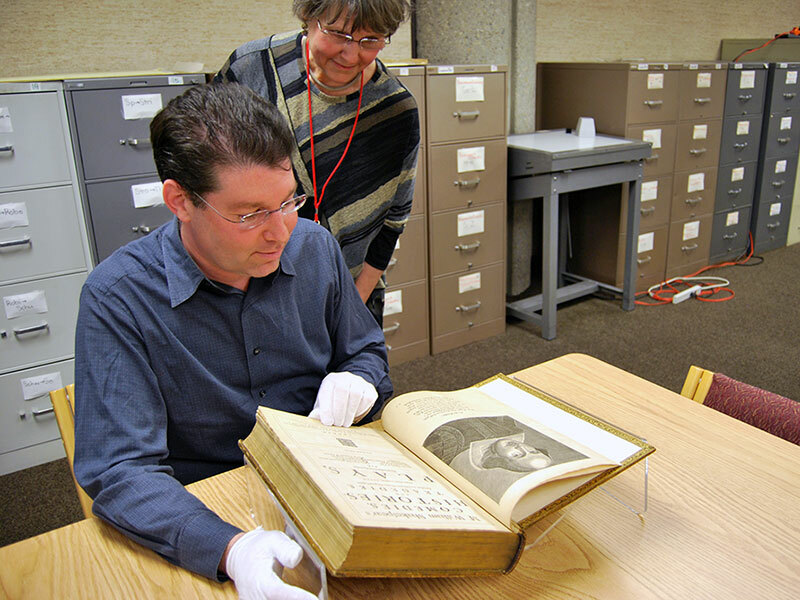 Shakespeare’s Fourth Folio, published in 1685, served as the basis for the first edition in modern English of Shakespeare's works Archives & Special Collections at UofL houses a copy in its permanent collection. Today buying the collected works of William Shakespeare is as easy as logging in to Amazon.com. Or visit Carmichael’s Bookstore and peruse the well-organized, brightly lit shelves of the drama section, where you’re sure to find Shakespeare’s work on display. But in 1623, you’d need to slosh through the mud and refuse of 17th century London to get to St. Paul’s Churchyard. 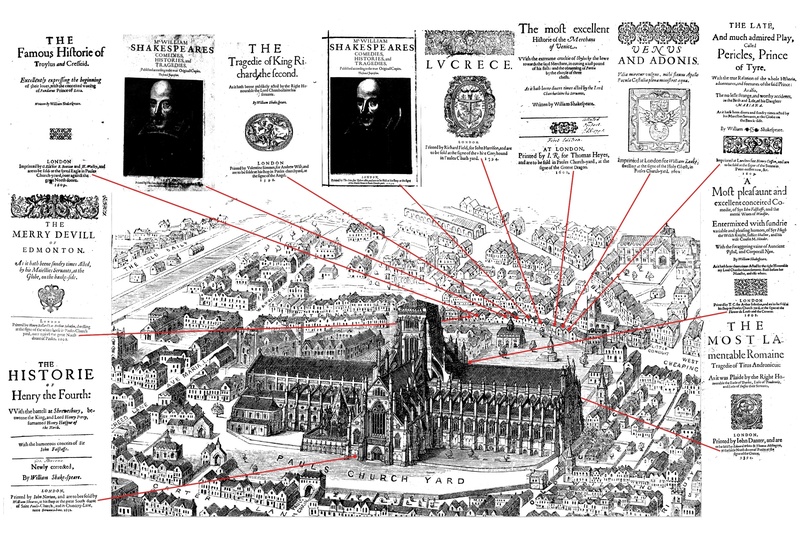 Among the crowds of people gathered to hear sermons from Paul’s Cross and purchase penny pamphlets announcing breakouts of the plague, would be bookshops and open-air bookstalls selling Ovid’s Metamorphoses and quartos of Shakespeare’s Richard III. It was to Jagger’s print shop, where press men collected urine in a bucket to bind ink to the page, that Shakespeare’s former friends and fellow actors in the King’s Men, John Heminge and Henry Condell, brought the playwright’s works. The First Folio was based on what decent and passingly accurate quartos Heminge and Condell could find along with manuscripts, drafts, and sides – long pieces of parchment paper with only an individual actor’s lines written on them. Appreciation of Shakespeare was not necessarily then what it is now. Prof Andrew Rabin (English) and Prof. Delinda Buie (Curator, Rare Books, Archives & Special Collections) page through Shakespeare’s Fourth Folio, published in 1685. The book is part of the permanent collection in Archives & Special Collections at UofL’s Ekstrom Library. “The significance of the First Folio cannot be overstated – indeed, it’s become something of a commonplace to say that without the First Folio, there would be no Shakespeare,” said Prof. Andrew Rabin (English), director and coordinator of Will in the Ville events and programming for UofL. “Only seventeen of Shakespeare’s plays were printed in his lifetime, so without the First Folio more than half of his works – including such masterpieces as Macbeth, As You Like It, Twelfth Night, Julius Caesar, and The Tempest – would not have survived. The approximately 750 First Folios printed were purchased by individuals, for city collections, and sold by booksellers in St. Paul’s Churchyard alongside the cacophony of pealing church bells, barking dogs, and criers advertising religious works. Now nearly 400 years later, Louisvillians will have a chance to look upon the world-altering publication – the first book of Shakespeare’s works, the first book devoted exclusively to dramatic works, and the first book marketing not only the words it contained, but the person who put them on the page. And not only that, the University of Louisville’s Archives & Special Collections department will have on display their copies of Shakespeare’s 1685 Fourth Folio, Benjamin Jonson’s 1616 First Folio, and Beaumont & Fletcher’s 1647 folio. All will be part of the Frazier History Museum’s exhibition First Folio! The Book That Gave Us Shakespeare from November 10 through December 10, in partnership with UofL and the Louisville Free Public Library. The Department of English is sponsoring a public lecture on Nov. 17 by Dr. James Shapiro (Columbia University), author of 1599: A Year in the Life of William Shakespeare. The Departments of English, History, and Geography/Geosciences are collaborating on a digital map and database of historically important Shakespearean productions in Kentucky using GIS technology. The Departments of English and Fine Arts are collaborating on a day-long, hands-on workshop on Renaissance printing practices, which will be open to the public, on Nov. 12. The Creative Writing program (English) is collaborating with Walden Theatre/Blue Apple Players and the Louisville Water Tower on a program called “Sonnets on a Sunday,” which will combine Shakespeare’s sonnets with poems composed by UofL undergraduates. The Liberal Studies program and the ACC will be cosponsoring a public discussion and lecture by Professor Peter Holland (University of Notre Dame) in collaboration with Actors Theatre in connection with their production of Macbeth. The Department of English is collaborating with Sister Cities of Louisville to mount a program entitled, “The World in Shakespeare/Shakespeare in the World,” on productions of Shakespeare’s plays in other countries and other languages. The Department of Theatre Arts will be mounting a production of King Lear. The Medieval and Renaissance Studies program will be running weekly gallery talks at the Frazier on items in the First Folio exhibit. There will be a host of smaller events and collaborations with organizations around Louisville in the run-up to the First Folio! Exhibit. For information on exhibits at the Louisville Free Public Library, and elsewhere in the community, visit LFPL’s Will in the Ville. The Archives & Special Collections received the Fourth Folio as a gift presented by former Liberty National Bank President Merle Robinson in 1960. The Jonson (1616) and Beaumont and Fletcher (1647) folios were gifts of Louise Yerkes and Richard Morgan Kain in memory of Mrs. Kain’s father, Richard Yerkes. Community members, students, faculty, and staff are welcome to visit between 8am and 5pm, Monday through Friday, to view these incredibly beautiful, historical, and significant works of art and lodestones of culture. For more information, contact Archives & Special Collections at (502) 852-6752 or visit their website at Archives & Special Collections.